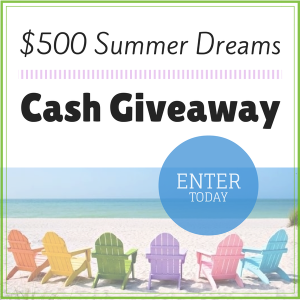 $500 Summer Dreams Cash Giveaway | A Savings WOW! We know with the end of summer and getting ready for back to school time, there is more money going out, so wouldn’t you love the chance to win some money to help offset your costs? We have joined forces with an amazing group of bloggers to bring you this great giveaway. One lucky person will win $500 cash. Complete the tasks below to earn entries into this giveaway. Refer your friends using your unique link to earn even more chances to win. Open Worldwide. Ends at 11:59pm ET on August 19th, 2014. Disclosure: This giveaway was coordinated by Giveaway Promote.